Image caption Mr Clinton, speaking at the White House, called the tax cut compromise "a good deal"
Former US President Bill Clinton has urged Democrats to support a deal President Obama negotiated with Republicans on tax cuts. 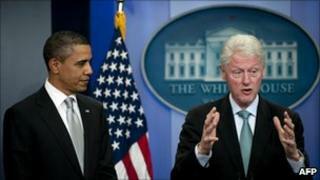 "I don't believe there is a better deal out there," Mr Clinton said following a private meeting with President Obama. Mr Obama said earlier he is confident that the tax cut deal will pass. The White House is working to persuade reluctant Democrats to back the tax plan, which would extend Bush-era tax cuts, as well as unemployment pay. Mr Obama and Mr Clinton made an unexpected appearance in the White House press briefing room on Friday afternoon after a private meeting that Mr Obama described as "terrific." Mr Obama left before the news conference concluded, leaving Mr Clinton to field questions on partisanship, the deficit and political compromise. Mr Clinton has experience of the need to work with Republican opponents: following mid-term election losses after his first two years in office, he faced a hostile Congress similar to the one Mr Obama will have to deal with from 2011. He warned that the US cannot afford a long-standing stalemate like the one that shut down the federal government during his presidency in 1995. "Both sides are going to have to eat some things they don't like," Mr Clinton said. "We don't want to slip back into a recession. We've got to keep this thing going and accelerate its pace. I think this is the best available option." Mr Clinton also voiced unequivocal support for the New Start nuclear weapons treaty with Russia, which would reduce both countries' nuclear arsenals and allow each to inspect the other's facilities. The deal has run into congressional opposition, with some Republicans pledging to block ratification. In the House of Representatives, Democrats voted on Thursday to reject the initial tax cut deal but Mr Obama said negotiations would continue. "Here's what I'm confident about: that nobody - Democrat or Republican - wants to see people's pay cheques smaller on 1 January because Congress didn't act," Mr Obama told US broadcaster National Public Radio in an interview aired on Friday. But Mr Obama is facing a revolt within his own party. Several left-leaning senators, led by Sherrod Brown and Bernie Sanders, are threatening to filibuster the bill when it comes to the Senate. A filibuster is a procedural tactic that allows senators to talk non-stop in order to prevent a vote. Senators routinely threaten to filibuster, but they rarely actually carry one out. Mr Sanders hinted at his seriousness on Friday, passionately railing against the tax cuts on the Senate floor for hours. Under a proposal the White House crafted with Republicans and announced this week, tax cuts enacted by President George W Bush in 2001 and 2003 and set to expire this year would be extended at all levels - including for the wealthiest Americans. Some unemployment benefits would also continue, and the estate tax would be lowered. Mr Obama and his Democratic allies had vigorously opposed allowing low tax rates for wealthy Americans to continue at a time of massive budget deficits, but Senate Republicans rejected Mr Obama's preferred approach and the president said he saw no option other than compromise. In the NPR interview on Friday morning Mr Obama called for a broad reform of the US tax system, which he said would include broadening the tax base, closing loopholes available to "well-connected folks or people who have good accountants", and lowering rates. "We've got to start that conversation next year," he said. "I think we can get some broad bipartisan agreement that it needs to be done. But it's going to require a lot of hard work to actually make it happen." What happens when your unemployment benefits stop?